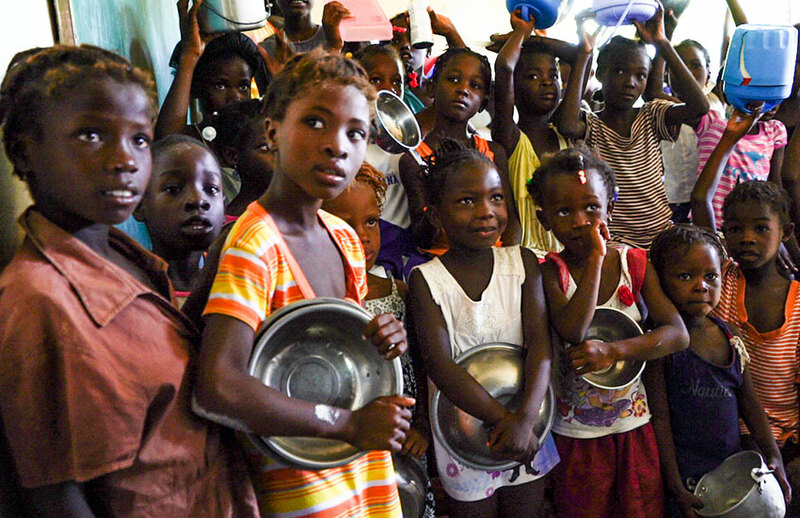 Haiti is Facing a Food Crisis - The worst in many years. 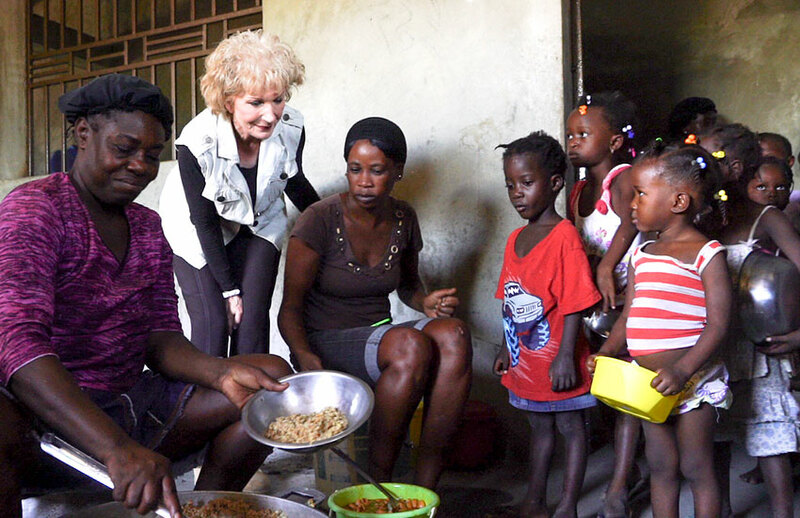 One of our heaviest burdens is the need to feed the poorest of the poor in Haiti. Haitians cannot afford to feed their families and babies. They suffer from no jobs, a lack of food, and the “high price of food,” which is made worse by very little rain. They are facing a food crisis, and the need to feed so many increases every year. This food crisis has been going on for years! We have never seen food scarcity this bad in all the years we have been living in Haiti. We see children eating from garbage dumps, eating cookies made from dirt, and drinking salt water to ease the pains of hunger. It breaks our hearts to see these children suffer. When Bobby and I first came to Haiti, we saw so many children and babies starving to death, because their mothers could not afford to buy food. We struggled for several years until we partnered with Mark Crea, the president of Feed My Starving Children to bring food into Haiti. 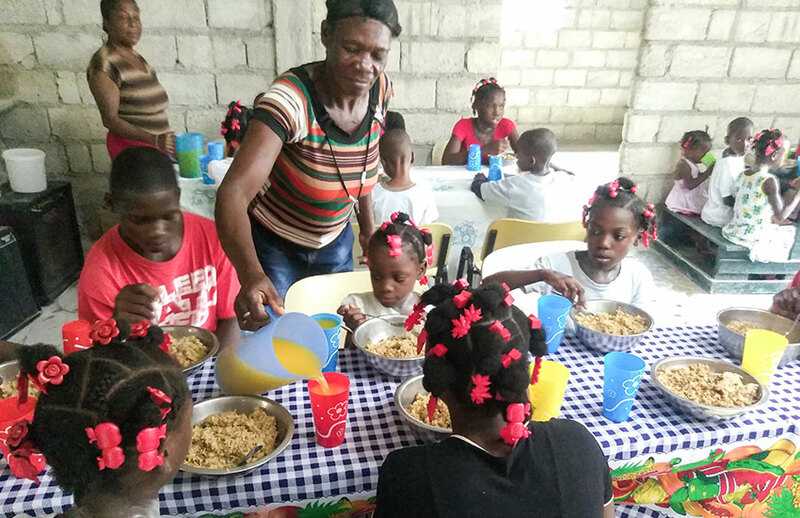 Love A Child shares thousands of meals with other missionaries and organizations throughout Haiti each month. These groups come to our Kingdom Connection Food Distribution Center and load up their trucks and buses to take food back to the hungry children in their area. Each month, we open our monthly food distribution for over 90 organizations; over half are orphanages, and many are missionary groups that desperately need the food. We give out almost 600,000 meals each month! Thank you, Feed My Starving Children for donating the eight containers of food each month. 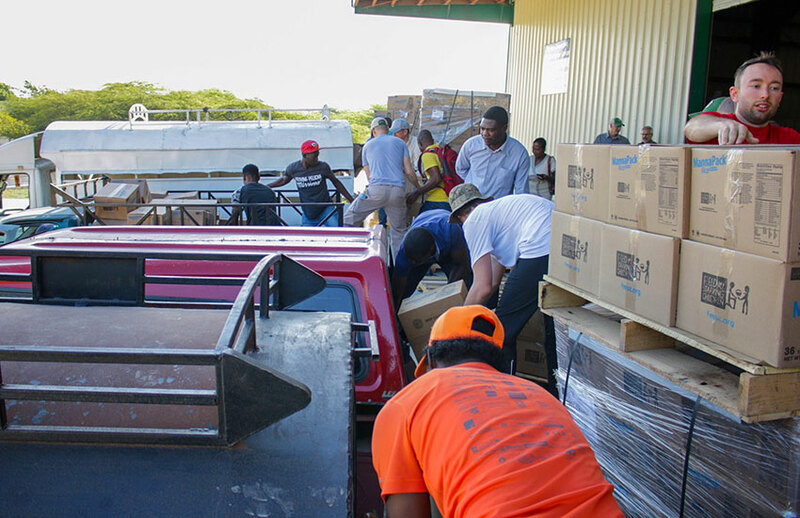 We are also so grateful to our partners, who by faith each month help us with the $10,000 per container for transport into Haiti. 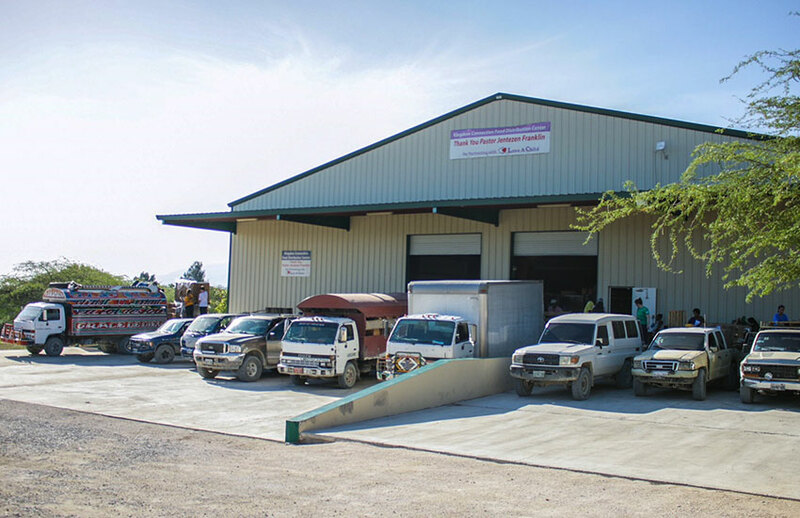 Thank you, Jentezen Franklin and his Kingdom Connection Partners, for sponsoring the building of our Kingdom Connection Food Distribution Center, and for $10,000 each month for a container of food. 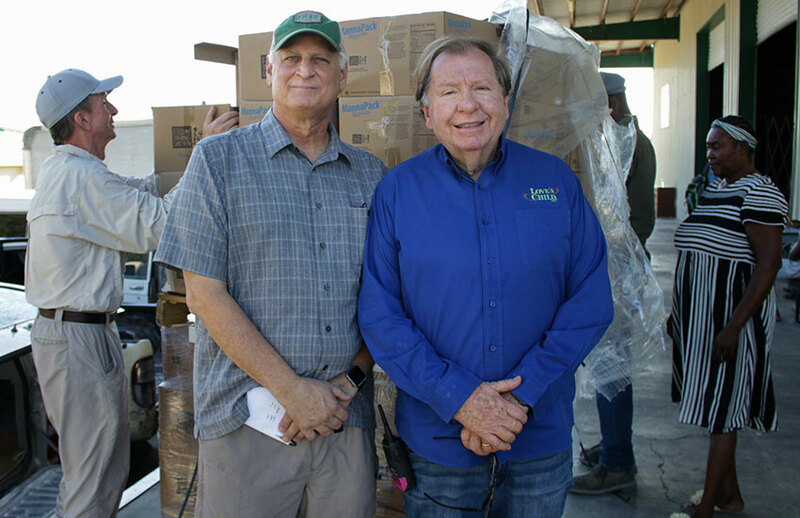 Furthermore, thank you, Joyce Meyer Ministries — Hand of Hope for $10,000 each month for a container of food. Thank you, partners, for sacrificing and giving large, small or the widow’s mite to feed the poor… by FAITH each month! There is a Creole Proverb that says, “Sak vid pa kanp.” It means, “An empty sack cannot stand.” When you are hungry, you cannot stand, you cannot learn, you cannot even work. Hunger takes over. Here is a letter from one of the orphanages that we help feed each month. It is called the MABO Orphanage. 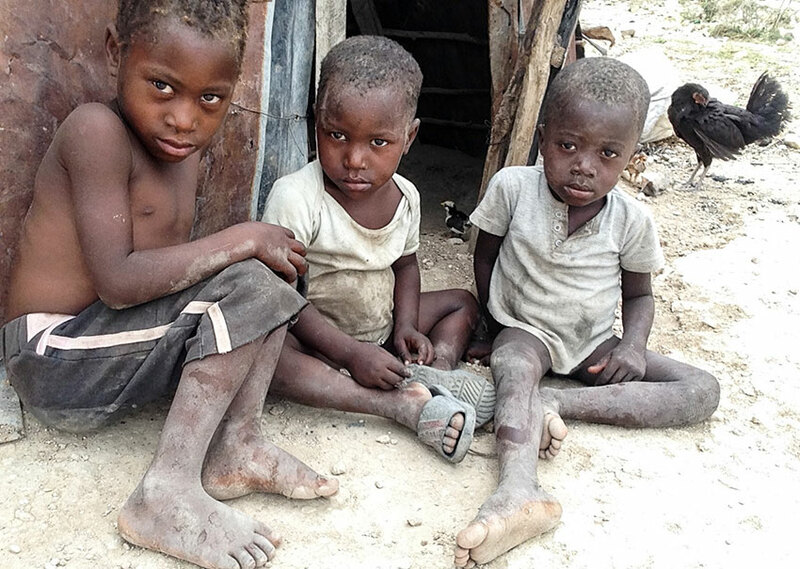 MABO and MABE orphanages, as always, would like to thank you so much for the great work you are doing in Haiti to help out the many people who don’t have access to the minimum needs in their lives to survive. May the Lord in His power continue to bless you all and your family for a very long time with the work that you are doing, by keeping you in good health. Reverend Jonel runs this wonderful orphanage at the Orphélinat Notre Dame du Perpétuel Secours. Just look at these sweeties, eating hot, nourishing food! 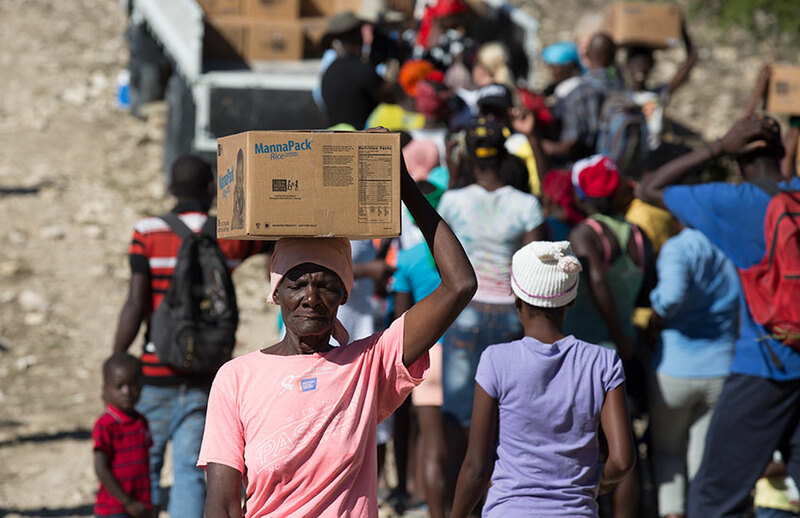 We are proud to partner with others that are helping Haiti’s children. The food we share not only goes to feed children, but also to feed the elderly who have no one to care for them. 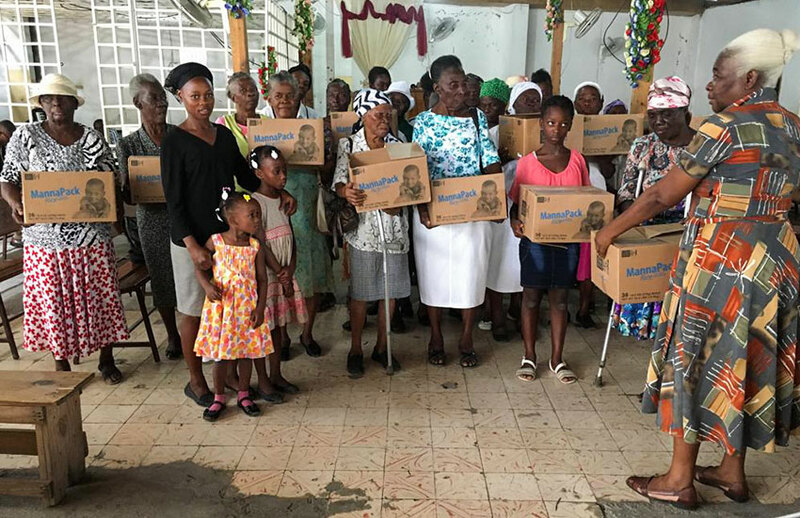 These precious elderly ladies received food through the First Christian Church in Pétion-Ville, which is the head of all of our Love A Child Churches, under Pastor Lionel Narcisse. This group is one of the many churches and organizations we share food with each month. Each container we receive has 272,000 meals. It takes “all of us working together” to feed hungry people. 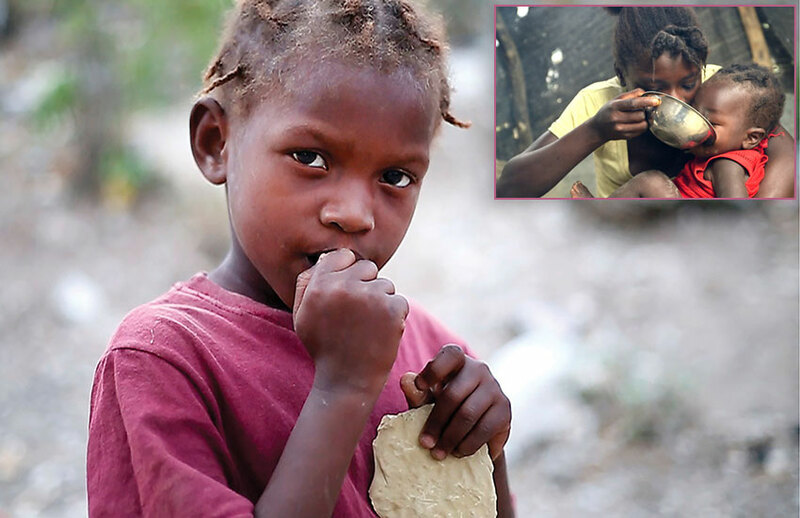 In many areas of Haiti, children are eating “mud cookies” to fill the hunger in their stomachs. Other children are putting “salt” in water and boiling it and “drinking it” in place of food. Each month, through our Feeding Programs, we distribute food to many villages that depend on us. Most are too far away for the people to travel to our warehouse to pick up food. We truck the food to each location where the people meet us with their vouchers as we unload the food. We recently discovered a collection of ramshackle kay-pays (straw huts), high in the mountains in an area called Mòn Deral. This tiny village was one of the saddest sights we have seen in some time. We had a wonderful time with the poor people and children in Mòn Deral. The area is so dry, and you can’t grow food as there is no rain. Gardens and animals could not survive here. The people are so poor that none of them even had a small wooden table or a single chair. We brought food to them, and we had to sit on boxes and buckets to cook. 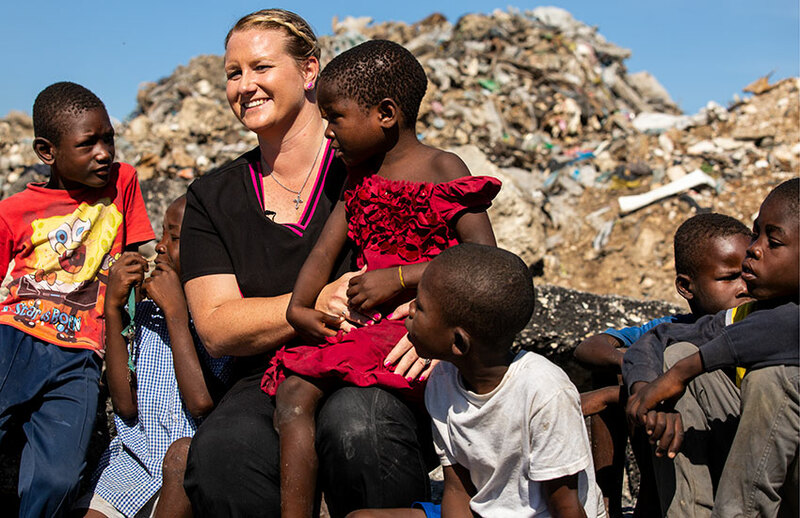 We have been working in two large areas of the garbage dumps in the slums of Cité Soleil near Port-au-Prince, Haiti. One area is Truttier. There are over 300 families with small children in this area. It is also in a “very dangerous” area to work. If you do not have the local police helping you, and some local security, you would probably not come out alive. Thieves with guns and knives control the garbage dumps. 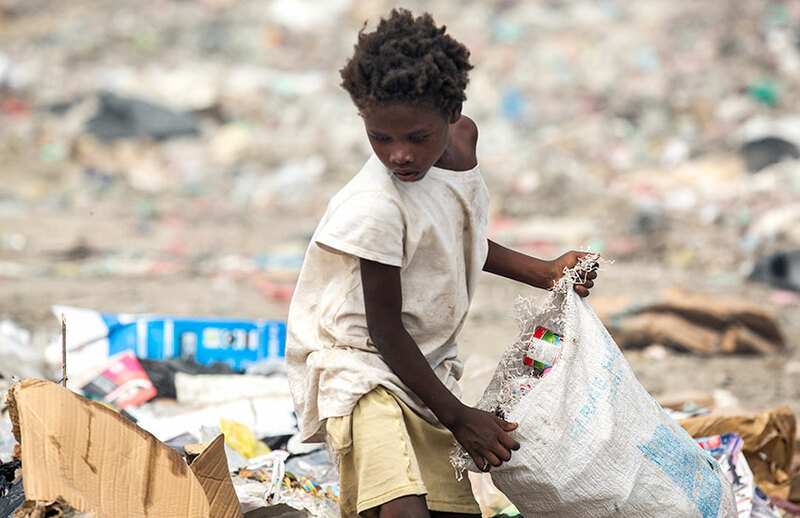 Hundreds of little children depend on the “rotten food” they find, or they depend on something “thrown away” to sell. They never have a full meal each day, let alone, three full meals a day. 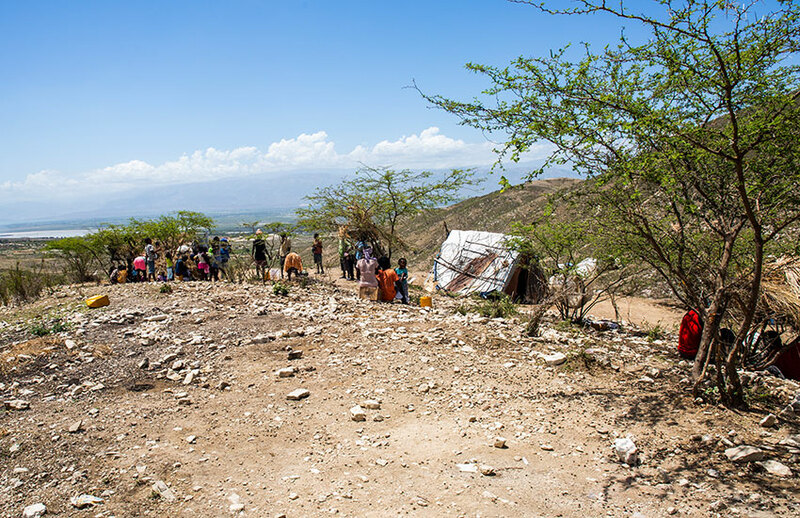 Life is not fair, but God is there… The food we bring them cannot solve all their problems, but the Haitians say, “This brings them hope” that someone has not forgotten them! God bless you, partners, and thank you with all our heart. We took the volunteer team from Feed My Starving Children to Chambrun, which is a Voodoo village. We distributed food to nearly 300 people. They were all sweet, and the distribution went well. Mark Crea, the President of FMSC, was with us. The local leader is also the village witch doctor named Jorel. You can see the little black instrument in his hand, that’s a Taser! He uses it to control the bad guys in the crowd. The rain began right as we were getting ready to leave! Food is the tool that we use to gain the hearts of the people so that later we can witness to them. We expect that one day, we will “catch some fish” for Jesus! In many of the areas where we deliver food, it can often be dangerous. We must travel with local Security Guards, several Haitian Police, along with our Haitian staff. It is still tough to keep the good people in the food line… and the bad people away from it. It is very dangerous, but we came to share the “Love of God.” The Creole proverb says, “A hungry man cannot hear…” so we must feed them first to gain their trust. 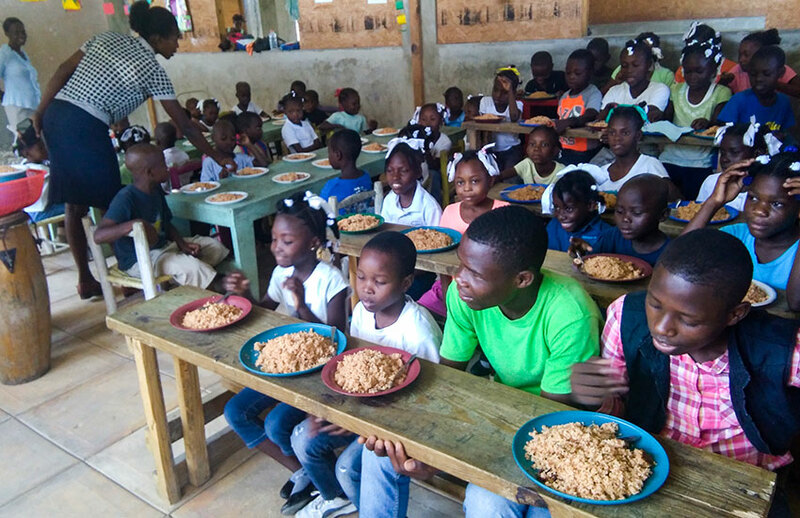 We feed thousands of schoolchildren throughout Haiti. Through our Child Sponsorship Program, we provide education, nutrition, and healthcare to over 8,000 students at our 18 schools. 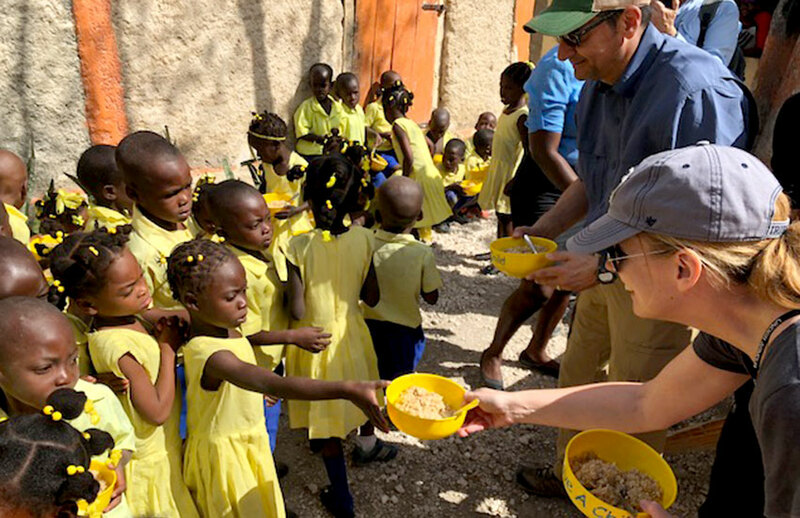 Our Feeding Program reaches many children in the remote areas of Haiti, that normally would not have the opportunity to attend school, and they receive desperately needed food. Feed My Starving Children volunteers joined us to help feed the children at the Love A Child School in Lastik. 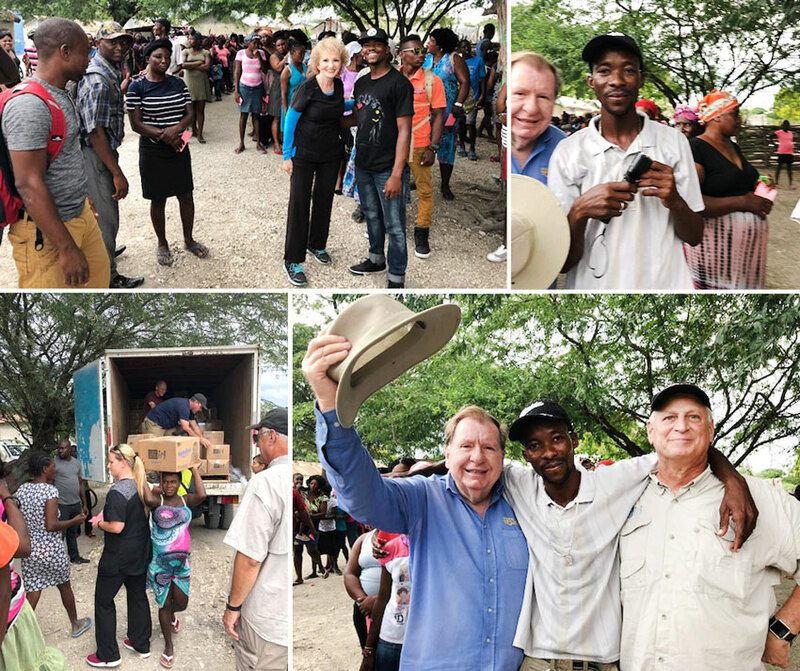 We are so grateful that so many of you have the love and compassion to help us bring not only food and water to the “poorest of the poor” but also some hope and dignity to these precious children in Haiti. You, our partners, make this possible, and we need to do more! Together, we are better! 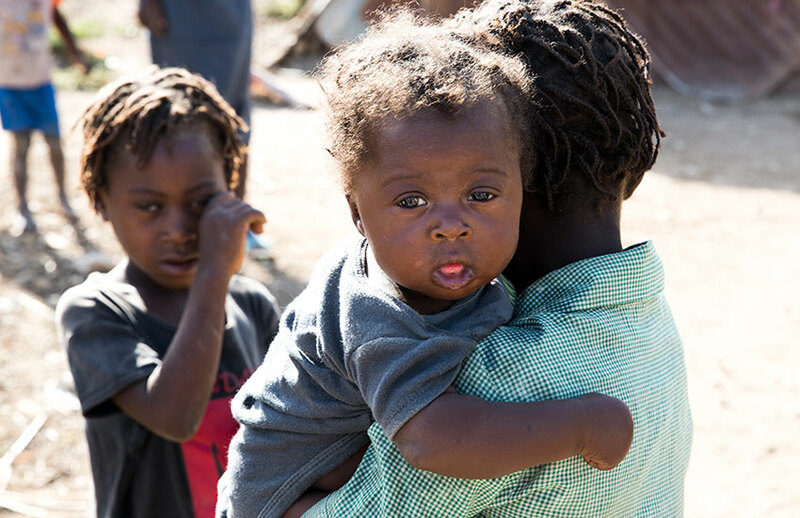 Please pray about how you can continue to make a difference in the lives of hungry children in Haiti! You can email us any questions at info@lachaiti.org. You may also give securely online, or call our office at 239-210-6107 and let a staff member know you want to help. Whatever small thing you do unto the poor today, you do it unto Jesus! Let your heart be touched with the “cry of the poor.” Please consider donating any amount you can to help save thousands of children this year.